OSU then-redshirt sophomore Nathan Tomasello competes in a match against Arizona State on Nov. 13. 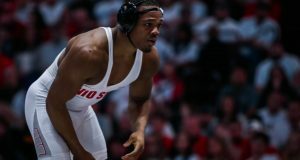 The Ohio State wrestling team traveled to Las Vegas over the weekend, competing against multiple top-ranked schools, ultimately cashing in and earning a team tournament championship. Sunday’s conclusion of the Cliff Keen Las Vegas Invitational saw the Buckeyes at the top of the podium with 118.5 points, where OSU had two individual titles in its respective weight classes, along with a runner-up and two third-place finishers. At 133 lbs. redshirt junior Nathan Tomasello captured the Buckeyes’ first individual title of the weekend along with his 2nd CKLV Invitational title of his career. The final match was the highlight of Tomasello’s tournament, where he scored a match-winning escape in the third period to win 3-2 over Stevan Micic of Michigan. Micah Jordan, a redshirt sophomore at 149 lbs., finished first after a strong tournament performance in both the semifinal and final. In Jordan’s title match, he scored a four-point near fall with a minute and a half left in the match over Pat Lugo of Edinboro. This championship win marked his second straight CKLV Invitational title. Redshirt freshman Jose Rodriguez at 125 lbs. dominated in his semifinal match, cruising to a 17-3 technical fall. In the final match, Rodriguez faced off versus top-seeded Joey Dance of Virginia Tech, where Rodriguez was taken down by Dance with six seconds left in the match, conceding a 4-3 loss. After falling in an upset defeat in the semifinal match 6-4, sophomore Myles Martin at 184 lbs. regained his confidence, bouncing back to a 22-7 tech fall over Steven Schnieder of Binghamton, taking him down nine times throughout the match to claim third place. OSU redshirt freshman Kollin Moore at 197 lbs. rebounded after two early losses, also finishing third with a 9-7 decision victory over Jacob Smith of West Virginia. The Buckeyes return back to Columbus for their first home match of the season on Thursday, Dec. 8, where they face off against the No. 5 ranked Missouri Tigers at 7 p.m.